Did you have a hobby horse? Do you remember riding stick ponies or horses when you were a child? I do! All three of us, my sister, brother, and I, got stick horses for Christmas when I was little. We had so much fun riding our 'horses' through the house. Sometimes we were so rambunctious, Mom sent us outside to play in the backyard! Most of the time, our stick horses were stuffed plastic heads on a stick purchased at the Ben Franklin's Five and Dime store. One year, however, Mom made almost all our Christmas gifts. For my sister and me, she made stuffed animals. I got a stuffed pony. My sister got a stuffed cat. My brother got a homemade stick pony made with brown fabric and yarn. When our 'horses' heads were worn out, we sometimes tied a string on an old broomstick and used our imaginations to see the horses we were riding. We played for hours running around the house and the yard. Sometimes we were playing sheriff and outlaws, sometimes we were playing ranch and breaking horses to the saddle, and other times we were just out 'riding' the horse riding trails we pretended were in our backyard. And the best part was that we didn't have to take horseback riding lessons to have so much fun. My husband tells me that he, his siblings, and all his cousins had a stick horse at his grandparent's house. The 'corral' was the corner of the old smokehouse. When the family got together, each child would find his or her very own stick horse and they would play in the pasture while the adults visited. When our children were small, they had stick hobbyhorses to ride, too. They named their horses, and no one was allowed to ride anyone else's horse. I was told the horses were trained to buck off anyone but their own riders. Originally, stick horses were called hobbyhorses. Hobby horse toys were named after the extinct Irish hobby horse. These days, you can find plush stick ponies in a large number of fabrics and designs, such as the plush Melissa and Doug Gallop-n-Go Stick Pony Toy Horse w/ Sound Effects pictured above. It features realistic neighing sounds accessed by squeezing the button in the pony's ear. This toy is rated for ages 3+ and requires two AA batteries (not included). Hobbyhorse stick horses come in many different styles and colors. For the more fanciful child, you can even get stick unicorns! Click the links below to find instructions for a DIY stick horse! 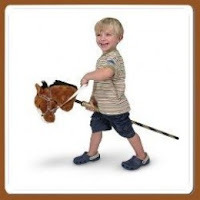 This Aurora World World Giddy-Up Stick Horse 37" Plush, Beige makes gallop and neigh sounds when the ears are pressed. The fabric bridal has a Velcro safety release, and the wooden stick has a cap on the end for safety. Have a Fun Stick Horse Race with Neighborhood Kids! Did you have a stick pony or hobbyhorse when you were a child? If so, did you share your stick pony adventures with your children or grandchildren? We had so much fun with our stick horses. Probably more than kids have with all the electronic toys they have now.